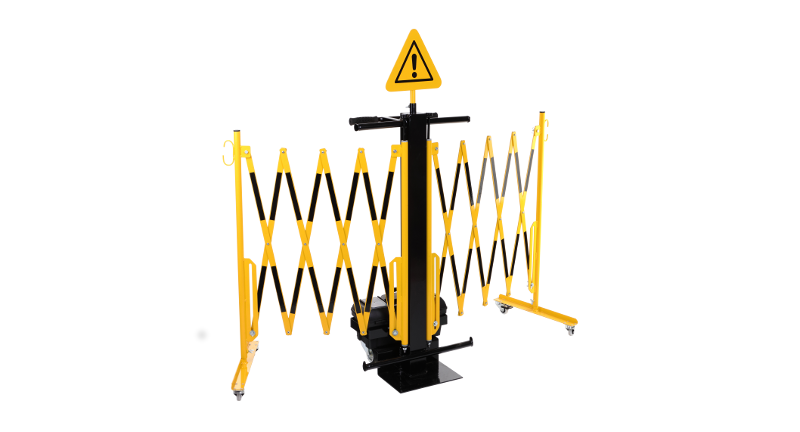 Expanding barriers have become indispensable at the daily routine of inhouse maintenance. They are particularly well suited for fast and reliable shut-off of suddenly occurring sources of danger or for the temporary shut-off of areas for assembly, maintenance or cleaning work. They are much important in customer traffic areas with high frequency, like shopping malls or at train stations and at airports. Those who need the utmost flexibility opt for the use of a mobile expanding barrier trolley. The first advantage of this innovative shut-off option is the perfect storage of the barriers. It can be pushed together and be stored in a space-saving manner. The second advantage and much more decisive aspect, is the mobility of the expanding barrier trolley. It consists of two yellow / black frame elements, which be attached to the left and right of a sturdy steel spar. They can each extended to 2 meters in length and given up to 180 °. Thus, the expanding barrier trolley is able to shut off dangerous areas safely. With the help of the wheels mounted at the trolley, it can easily and comfortably transport to the place of work by only one person. A toolbox and a yellow / black warning triangle complete the scope of delivery of the trolley. The high quality flat steel, from which the expanding barriers are made, are extremely flexible and very resistant. The powder coating protected the quality of flying rust. Thus, the expanding barrier trolley is perfectly equipped for indoor use. Of course, you can also choose a different color besides the standard colors. Ergonomically shaped handles and practical pull out eyelets complete the versatility of the expanding barrier trolley. Was versteht man eigentlich unter REACH-Konformität?